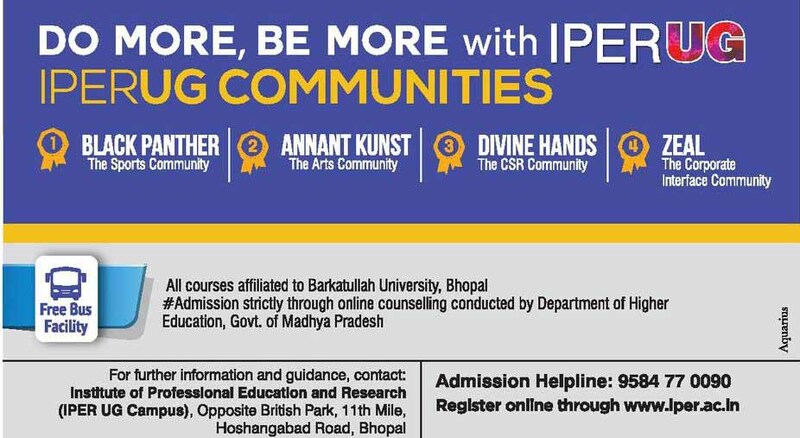 Why pursue B.Com (Honours) at IPER UG Bhopal? B.Com Honours at IPER prepares the individual for the modern busienss and commerce arena through focussed studies in all financial aspects. The Honours programe is thus a true career-oriented degree which provides a foundation in all financial aspects of business and commerce. Bachelor of Commerce (Honors) is a three year course at IPER. This course prepares them to face the emerging challenges of managing resources, managing business processes and managing managers. B.Com (Honours) is a three-year full-time undergraduate degree course affiliated to Barkatullah University, Bhopal. Admission to this course is conducted through the Higher Education Department, Govt. of Madhya Pradesh, once every year. Read the Admission Process section below to get the details of how to get . Free Bus Facility for all the students of B.Com (Honours) Course, round the Year. How to get admission in B.Com (Honours)? The Admission process of B.Com (Honours) full-time Undergraduate Degree Course at IPER UG Bhopal is conducted and regulated by the Higher Education Department, Madhya Pradesh through an online process. Students interested in taking admission in B.Com (Honours) have to complete registration process with MP Higher Education portal for admission in IPER Undergraduate College. Prepare students to harness opportunities being newly created in the Financial Accounting and management profession. Preparing students to exploit opportunities, being newly created in Accounting and Finance as the profession due to Globalization, Privatization and Liberalization. It aims to equip students with the knowledge and competence in the field of finance and accounts to pursue a professional career and / or furthering higher education in the specified areas of specialization. Eligibility for B.Com Honours 3-year full time degree course is as per the norms laid by Barkatullah University, Bhopal. Passed 12th standard (or equivalent) examination and obtained at least 60% marks. Which University affiliates Bachelor of Commerce (Foreign Trade – Practices & Procedures) Program at IPER? Bachelor of Commerce (Foreign Trade – Practices &amp; Procedures) is affiliated to Barkatullah University, Bhopal and is a 3-Year full-time programme. What is the Eligibility Criteria for getting admission in Bachelor of Commerce (Foreign Trade – Practices &amp; Procedures) ?